In 2010 I went to Rome for the very first time. I’d been to Italy many times but never Rome. This was the view from my hotel, the Marriott Grand Flora, at the top of Via Veneto. I was hooked as soon as my feet touched the ground. The smell, the chatter, the atmosphere. I remember standing on the banks of the Tiber with Castel Sant’angelo behind me, looking across the bridge towards the city, gasping for breath. It was almost too much to take in. I couldn’t even lift my arms to take a photo. I glanced at my husband, who stood next to me, and saw he felt it too. Rome isn’t just a trip, it’s an experience, its something you feel. My daughter Joanna and I met in the Marriott between Rome and Fiumicino. Both excited for the trip ahead. We had a fabulous meal and a little too much to drink, but we were on a new adventure, a house buying adventure and I think a celebration was in order. The following morning we picked up our rental car, a cute little Fiat Cabriolet. Yes its small! We had to load my suitcase in through the roof, but we managed it. Then off we went. This photo was taken outside a restaurant we stopped off at on the way. It was our first experience in rural Italy. Not a tourist in sight and no one spoke English. The restaurant was full of arm waving groups of Italian families enjoying a Sunday meal together. Wine was flowing and they were blissfully loud. Our meal was simple, delicious and very cheap. It set us up for our journey ahead. Pretty soon we were in an idyllic setting, completely surrounded by trees. It was beautiful. We didn’t know at the time, but we’d entered the Lazio, Molise & Abruzzo National Park. It was gorgeous. Photo may be a bit fuzzy, but it was taken from the car window as we passed by. It was Sunday so groups of folks took shade under the trees, enjoying walks, picnics, playing games and drinking wine. Roadside stalls were set up selling local produce. It was exactly the type of area I was looking for, but it was still a long way from Colledimezzo. We drove on narrow winding roads where there was barely space for two cars to pass. Wild horses roamed freely. We passed through tiny villages with cobbled streets. I could have taken more photos, but I was hypnotized by the scenery. For a while I thought we’d never reach the top of the mountain range, but we did, and we began to descend. Joanna did an incredible job of driving. I was exhausted and I was the passenger. By the time we reached Colledimezzo we were weary, but there it was, perched on a hillside. Beautiful and inviting. We drove through the village, but didn’t stop. Instead, we headed to Atessa where we were spending the night. Exploring Colledimezzo would have to wait until morning. We were in the Chieti province of Abruzzo. Would we find our perfect vacation/retirement home? Only time would tell. My Bags are Packed AGAIN! Three weeks ago my bags were packed for my Italian vacation. Now they’re packed for my Italian house hunt. Abruzzo here I come! 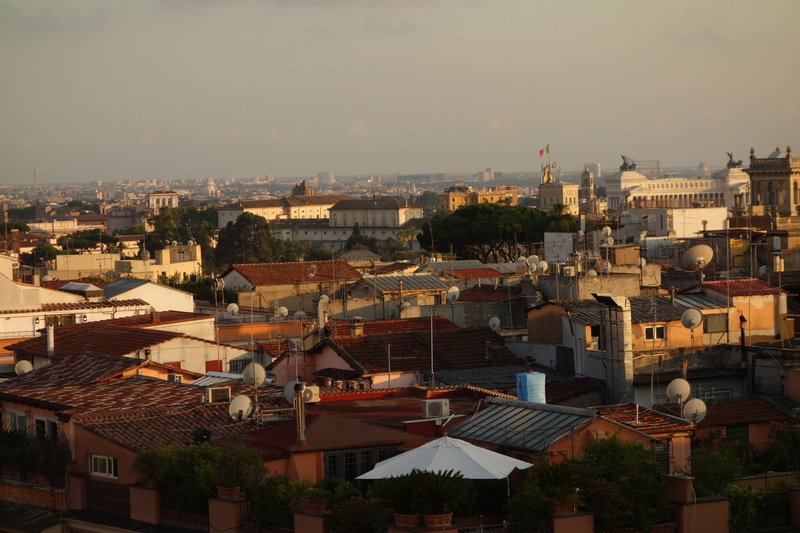 Cappuccino and the Rooftops of Rome! Thou shalt only drink cappuccino or any milky form of coffee in the morning, and never after a meal. The first time I tasted Cappuccino was in the early seventies. My mum and crazy aunt took me to Italy, Rimini to be precise. It was one of those package tours that were so popular in England back then. We stayed in the Hotel President, by Piazza Tripoli and just a couple of blocks from the beach. I’d dreamed of visiting Italy for as long as I can remember. Not sure why, but it was (and still is an obsession) of mine. I’m at home in italy, it soothes my soul. Now, even though I live in the US, I return as often as possible and have travelled from north to south. I have favorite cities and towns of course. Breakfast at Hotel Vittorio on the banks of Lake Garda is wonderful. An ice-cold glass of champagne overlooking the Amalfi Coast in the Beautiful Hotel Villa Maria is heavenly. Tasting wine at one of the many Tuscan Vineyards with good friends is amazing. However, one of the most exciting, exhilarating places to drink Cappuccino, is on the rooftop of the beautiful Marriott Hotel ‘Grand Flora’ at the top of Via Veneto in Rome! One cup is not enough as you sit and anticipate the day ahead. I never tire of it and I never will. For the love of Italy! Sunday Mornings find me sitting at the dining room table paying bills and catching up with friends on Social Media and by email. My view is pretty idyllic. Trees changing color, snow-capped mountains and clear blue skies. I love my home and I love Colorado, but…..as I sip my second cup of Cappuccino, my heart aches for Italy. I was fifteen when I visited Rimini for the first time. It was my first trip abroad. I was accompanied by my mum and my crazy aunty Jennie! I inhaled the Italian culture and was immediately hooked. Crazy aunty Jennie and my mum aren’t with me anymore, and I miss them. My obsession with Italy is still here though, and always will be. I returned the following two years with friends my own age, although I spent a lot of time on my own. They were smitten with the Italian men, who are of course, very handsome. I wasn’t oblivious to them, and enjoyed a holiday romance, but it was the country that won my heart. Even now when I think about Italy, I can barely breathe. I returned again in 1983, driving there from Germany where I lived with my husband, a British soldier. I worried he wouldn’t share my obsession, but he did. My daughter was seven when we took her to Italy for the first time. She might as well have been Italian she fitted in so well. Five years ago we spent two weeks in Rome and my love affair deepened. This year returned with friends and family. We did it all. Four days in Milan, two days in Garda, a week in Siena, a week in Rome and a week in Ravello. It wasn’t long enough, I wanted to stay forever. So as I sit here, sipping my Cappuccino (not to be drank after noon), I dream of Italy and scour Italian Real Estate because I know where I want to retire! This was taken in 2010 on our first trip to Rome. We stayed in the Hotel Grand Flora at the top of Via Veneto and this was the view from our window. The colors are so beautiful on this lazy hazy evening. I don’t think I’ll ever tire of Rome. I love everything about it. A trip to Rome feels like visiting an old friend who’s full of surprises. Can’t wait to return. 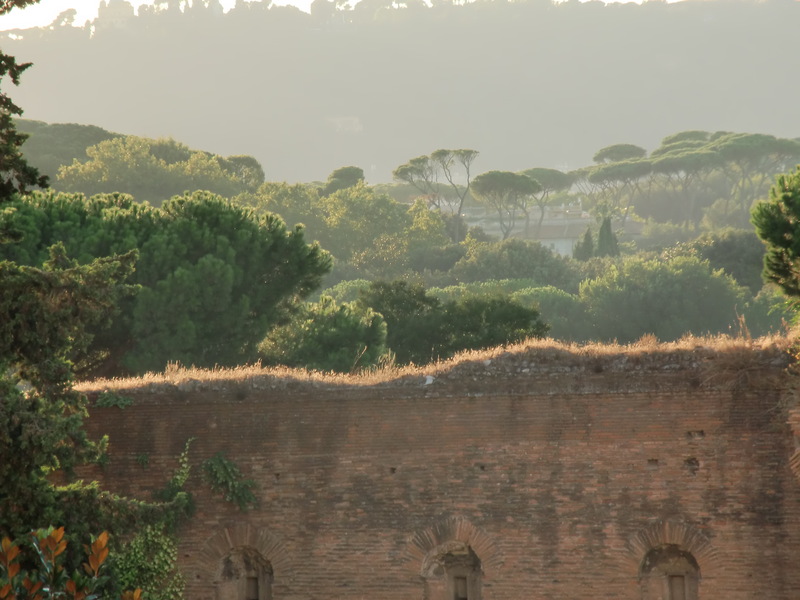 Hooked on Sunsets – Roma! 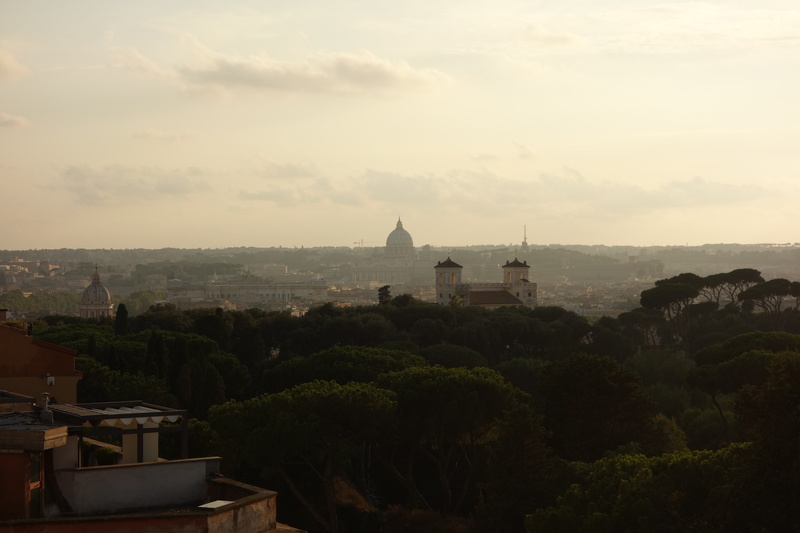 Hard to believe, but this beautiful sunset was taken from the top or the Spanish Steps in Rome. Rome is my favorite city! It’s never boring. There is a surprise around EVERY corner. The people, the food, the history, the beauty! An amazing sunset in an amazing city! A Home in Italy? I hope so! My first memory wasn’t pleasant, it was of a nasty, mean, miserable, violent man, my dad. Luckily I only had to endure him until I was four years old. The memory however, is etched in my brain. I’d say ‘God Rest his Soul’, but I don’t mean it! My second memory is Italy. I didn’t actually venture to that magical country until I was fifteen, but I dreamed of it from an early age. I think I was five years old when I became obsessed with Italy. I’m not even sure why. The man who drove the ice cream van that came to our village was Italian, and very nice to me. My mum’s hairstylist was Italian, Pietro, he was very handsome, and kind. I loved the movie ‘Roman Holiday’ (who didn’t? ), but honestly, I don’t know where my obsession with Italy started. I finally made my first trip to Rimini with my mum and my crazy Aunt Jennie in 1972, I was hooked. I returned every year for the next four years. I couldn’t get enough of the place. It touched my soul. In 1977 I was married and pretty soon had my husband hooked too. Italian cars, Italian wine, Italian food, Italian shoes, Italian Football. Rimini, Lido de Jesolo, Verona, Garda, Venice, Murano, Burano, San Marino, San Leo, I loved them all. In 2010, when I visited Rome, my obsession reached a whole new level. The history in Rome is overwhelming, the piazzas and cobbled streets, restaurants, and of course, the people! This year I spent three weeks in Italy, it changed my life. 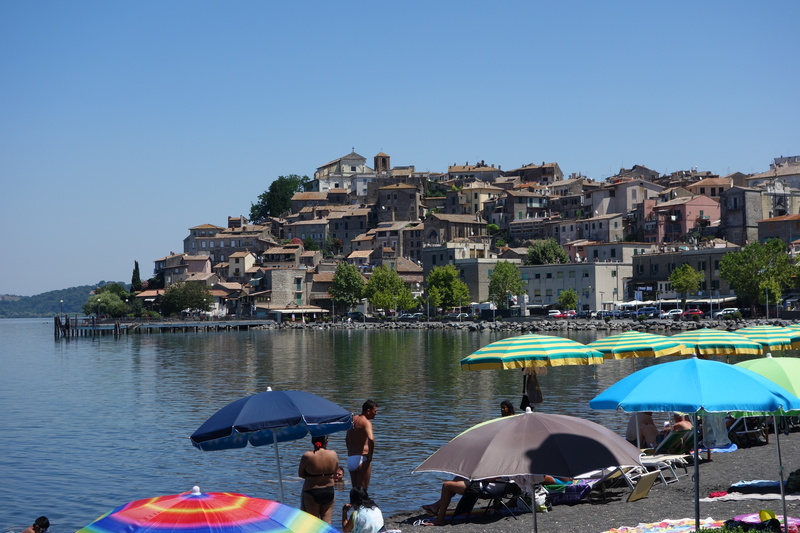 I visited Roma, Milano, Lake Garda, Siena, Montepulciano, Ravello, Positano, Amalfi, Minori and made an unplanned and surprising trip to Anguillara Sabazia on Lake Bracciano, just outside Rome. My husband was even more smitten than me. He’s a man of action and is now planning purchasing a second home there, with a view to living there when we eventually retire. I thinks its more than just a pipe dream. Maybe we’ll make a few more trips over the next few years, to find the perfect place, but it looks like my Italian dream may one day become my Italian lifestyle. I hope so! 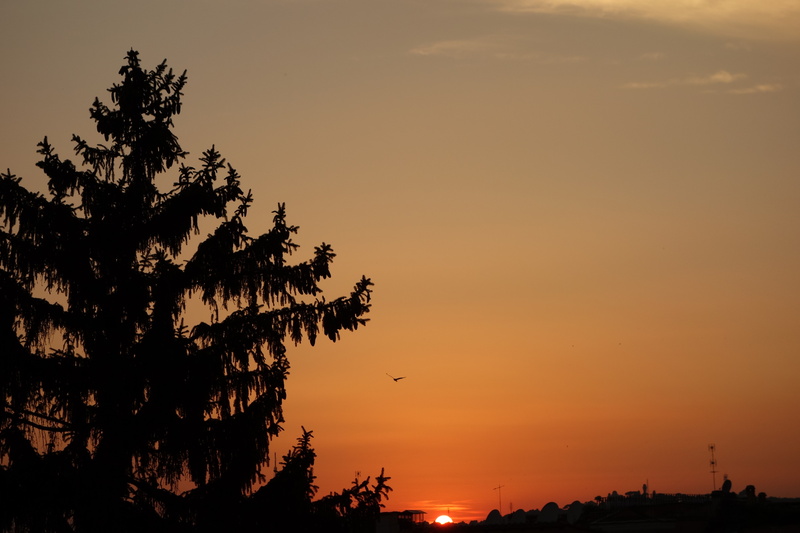 The sun sets on my last evening in Rome. So sad to leave. Can’t believe three weeks have already passed. Arrivederci Roma. Milano, Lake Garda, Siena, Montepulciano, Angulllara Sabazia, Positano, Minori, Amalfi and last of all Ravello. I actually cried as I walked across the market square for the final time in Ravello. The people and the views will be with me forever. Now the research begins to buy a second home here.